São Paulo, Brazil’s most populated city, hosts a true gastronomic and architectural gem right in the middle of all the hustle and bustle. 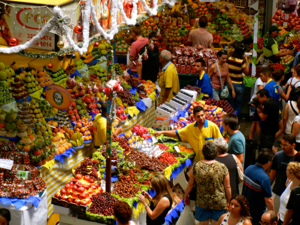 Mercadão, as it is known by the local Paulistas, is a public market that is a feast for all the senses. 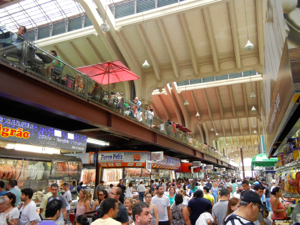 Formally named Mercado Municipal São Paulo, this architectural delight spans over 135,000 square feet and houses row after row of retailers boasting everything from fresh produce to cured meats to handmade Brazilian jewelry. 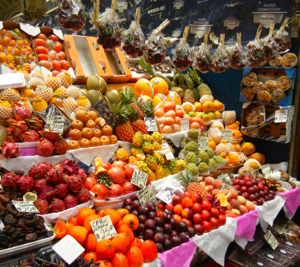 Wandering through the aisles of boldly-colored foods, the building is abuzz with chatter, laughter, and bartering. Locals will greet you with a smile as they proudly show off their wares. After sampling exotic fruits and fresh cheeses, make your way up to the second-floor mezzanine where the real, can’t miss gem awaits. The mezzanine, added during the 2003 renovation, has enjoyed phenomenal success. Housing eight restaurants ranging in food choices from sandwiches to oysters to desserts, this is a popular lunchtime spot for locals. The bird’s-eye view allows unobstructed admiration of the 32 stunning stained-glass panels that cast their light on the bustling market below. Upon reaching the mezzanine level, on most days, you are instantly met with a sea of people all in search of the proverbial pot of gold at the end of the rainbow. Of course, this means… the dreaded wait line. Lines aren’t your thing? Well, this one is done right. As you wait, servers tote their trays full of delicious chopp (pronounced shope), a light lager draft beer served extremely cold. That line instantly becomes a local pub where the Brazilian friendliness, as always, makes any wait tolerable. 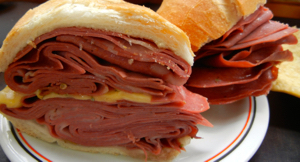 Given the endless food choices once seated, you’d be hard pressed to go wrong, but when in São Paulo the mortadella sandwich is a must. The lines all lead to Hocca Bar, an epic lunch counter that’s been serving up this gargantuan version of the classic Brazilian sandwich since 1952. Thin slices of salty pan-fried pork are piled high on a soft white roll and adorned with perfectly melted cheese dripping down over those deli-thin slices. There may never be a more perfect pairing for your ice-cold glass of beer. The menu boasts an array of delicious Brazilian snacks. If ever there was a time to wear your stretchy pants, this is it. Order the bolinho de bacalhau, a traditional Brazilian appetizer made of a salted cod and potato mixture that’s been breaded and deep-fried to perfection. Also not to be missed is the pastel, a fried pastry with filling choices ranging from four-cheese to Brazil’s famous steak, picanha. Ask for a seat by the railing to give you the best view of the market below while you settle into the leisurely lunch pace that the locals cherish. Open Monday through Saturday from 6 a.m. to 6 p.m., Sundays and holidays 6 a.m. to 4 p.m. If accessing by metro, exit at Luz or São Bento (blue line). Parking is available in private lots around the market for a fee.